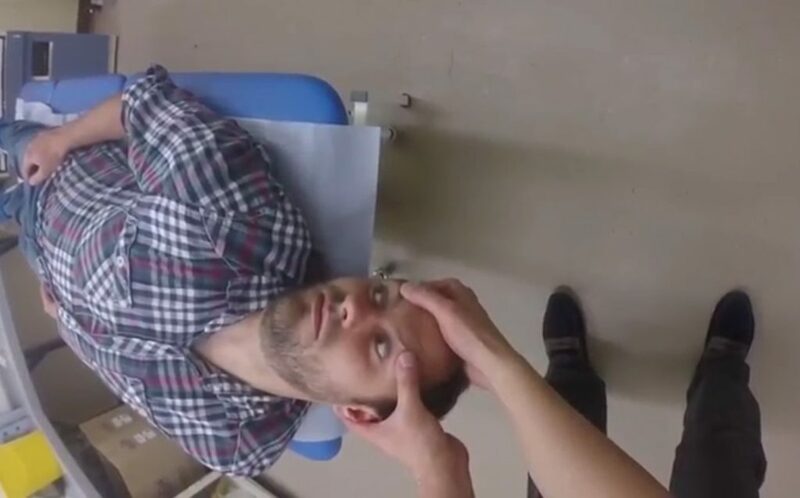 There are two main techniques used in the assessment and management of benign paroxysmal positional vertigo (BPPV) – the Dix-Hallpike test and the Epley Manoeuvre. The Dix-Hallpike Test is used for the diagnosis of BPPV, whilst the Epley Manoeuvre can be used for its treatment once diagnosed. Approach the examination in a systematic way, but be prepared to be instructed to move on quickly to certain sections by the examiner. Position the patient sitting upright on the bed, such that when supine their head will hang over the edge. Stand behind the patient, and turn their head to 45o to one side. Warn the patient about what you are going to do. Supporting the neck, lay the patient flat in one quick smooth movement, ensuring the head hangs over the end of the bed. Ask the patient to keep their eyes open and observe for any abnormal eye movements. You should observe for at least 30 seconds. Fig 1 – In the Dix-Hallpike test, the head should be positioned off the end of the bed. Next, turn the head to the contralateral side, approximately 30o past the midline. Maintaining the position of the head, ask the patient to roll onto their shoulder. Turn the head so that it is facing the floor (the chin should be near to the shoulder), and pause in this position for 30 seconds. Gently bring the patient to sitting position, ensuring the head position does not change relative to the trunk (their chin should remain near or on the shoulder). Pause for 30 seconds. Turn the head to the center, and flex the neck – placing the chin onto the chest. Pause for 30 seconds. Fig 2 – Position the head so that it is facing the floor, and pause in this position for 30 seconds. Thank the patient. Remember, if you have forgotten something important, you can go back and complete this.